It's summertime, and the beach seems to have a magnetic pull. The sun's warmth! Fresh air! Sand between your toes! Cool ocean water on a super-hot day! The relaxing sound of the waves! And an excuse to lounge around with nothing to do but read a (trashy) novel! But now that you're pregnant, SPF isn't the only thing you need to worry about (though you should be wearing at least SPF 30 at all times, because pregnant women actually burn easier)! 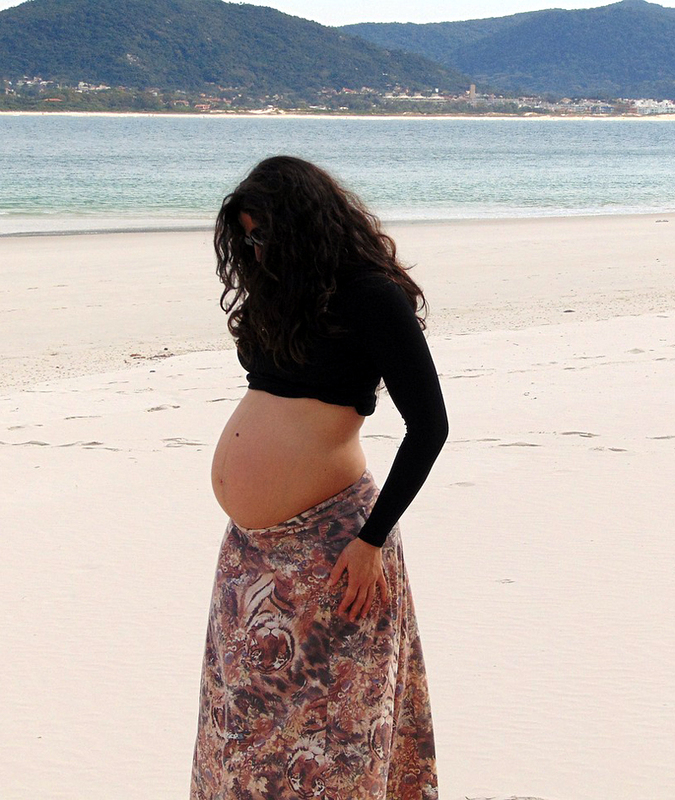 While there is no proof that UV rays can be soaked into your skin and somehow harm your baby, UV can break down folic acid, which is imperative while pregnant. Folic acid—which is a B vitamin found in foods like leafy greens, oranges and black beans—helps prevent birth defects of the spinal cord (like spina bifida) and brain (anencephaly), as well as cleft lips and palates and certain types of heart defects. Your body also needs folic acid to make normal blood cells and to prevent anemia, and it is essential to DNA production, repair and functionality. It is extremely vital in supporting the rapid growth of the placenta and fetus as well. One study found that women with folic acid deficiencies were two to three times more likely to have a premature baby or a baby of low birth weight than those who got enough of the vitamin. So if you are going to be tanning, it's especially important to make sure you are keeping up with your daily prenatal supplement. According to the March of Dimes, pregnant women should be getting 600 micrograms of folic acid per day either in their diets alone or in a mixture of diet and a prenatal multivitamin. Also note that increased melanin production mixed with sun exposure can lead to the "mask of pregnancy" (that weird raccoon mask-effect around your eyes that looks like you were wearing sunglasses while tanning), so make sure your time in the sun is limited and that you don't ever head out without sunblock. I'm sure you've already realized that pregnant women tend to get hot very easily, so be careful of overheating and dehydration—both are very dangerous for your unborn babe. Pay attention to heat advisories in your area (New York City has recently hit 100°! ), and if the heat index is in the 90s, stay indoors as much as possible with the A/C blowing, and cool down with a damp washcloth applied to the back of your neck or forehead. Drink plenty of liquids—eight ounces for each hour you're outside. Water is great, but you can also down OJ, milk or sports drinks that replace electrolytes you've lost while sweating. And if you're sitting on the beach, make sure to take long shade breaks every 20 minutes or so, and bring a mist bottle to keep your skin as moist and cool as possible. If you do become dehydrated, you're actually limiting oxygen and nutrients from getting to your baby, which could put his/her development in jeopardy. So drink up! Whether at the beach or pool, take frequent dips into the water. It not only cools you off, but it helps take some of your extra weight off of your sciatic nerve, which can get overtaxed and cause pelvis, leg, and foot pain. 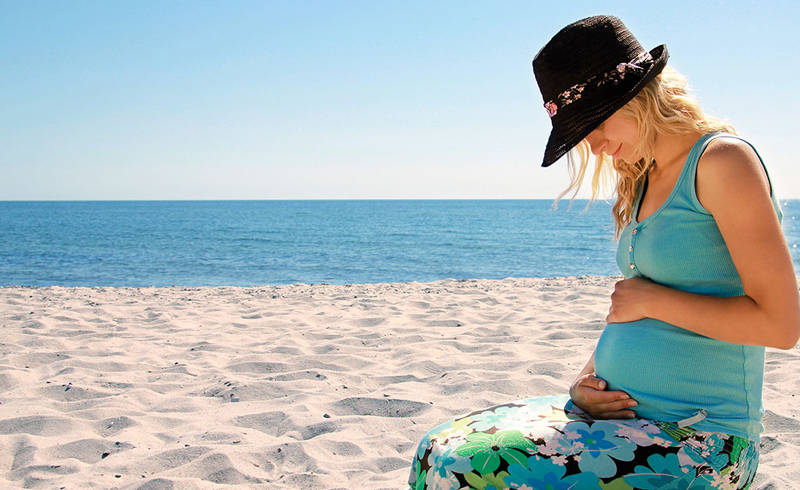 While bumming around at the beach—showing off your cute bump!—can still be a blast, you're taking care of two already, so keep your little bundle's needs in mind too before hitting the sand and surf. Happy summer!